Special Order - Please contact us for more information: orders@wordupbooks.com. Subject to availability. On a hot and dusty December day in 1980, the bodies of four American women - three of them Catholic nuns - were pulled from a hastily dug grave in a field outside San Salvador. They had been murdered two nights before by the US-trained El Salvadoran military. News of the killing shocked the American public and set off a decade of debate over Cold War policy in Latin America. The women themselves became symbols and martyrs, shorn of context and background. 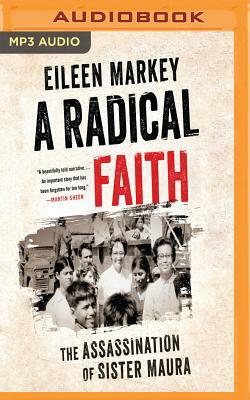 In A Radical Faith, journalist Eileen Markey breathes life back into one of these women, Sister Maura Clarke. Who was this woman in the dirt? What led her to this vicious death so far from home? Maura was raised in a tight-knit Irish immigrant community in Queens, New York, during World War II. She became a missionary as a means to a life outside her small, orderly world, and by the 1970s was organizing and marching for liberation alongside the poor of Nicaragua and El Salvador. Maura's story offers a window into the evolution of postwar Catholicism: from an inward-looking, protective institution in the 1950s to a community of people grappling with what it meant to live with purpose in a shockingly violent world. At its heart, A Radical Faith is an intimate portrait of one woman's spiritual and political transformation, and her courageous devotion to justice.